An ongoing pork shortage in China has buoyed global pork prices, sharply increasing U.S. exports and making hog futures one of the best performing commodities of the year. China is the world’s biggest producer and consumer of pork. But weak prices pervasive during 2014 and early 2015 led Chinese authorities to consolidate the pork producer industry and cut production. As part of the efforts to cull the industry’s environmental footprint, Beijing closed certain smaller farms near cities and consolidated producers in rural areas. In Fujian Province, “the government closed more than 13,000 backyard farms over pollution concerns,” a U.S. Department of Agriculture (USDA) report stated last year. But Chinese supply of pork decreased further than originally planned due to a disease outbreak in 2015, leading to shortages in some parts of the country. So far, China has been unable to increase supply domestically, which forced the country to import record amounts of hog. The supply squeeze sent pork spot prices skyrocketing beginning in mid-2015. Since April 2015, China’s pork spot price has increased from under 12 yuan per kilogram to 21 yuan per kilogram late last month, an almost 80 percent increase, according to independent research firm Shanghai JC Intelligence. Chinese demand for pork in 2016 has overwhelmed global suppliers. Exports of U.S. pork and pork products to China between January and April 2016 were 117 percent higher than during the same period last year, according to statistics from USDA. In April alone, pork exports to China and Hong Kong were up 66 percent from a year ago and the largest in volume in more than four years, according to the U.S. Meat Export Federation. Since April, China has surpassed Japan as the top buyer of U.S. pork. Strong import demand [in China] is likely to persist at least through this year. And experts do not expect the demand to slow any time soon. Despite the recent hike in exports, “while it is almost certain that the Chinese pork industry will gear up productive capacity at some point, Chinese prices for feed pigs and live slaughter pigs do not appear to have yet topped out,” USDA staff said in a June 17 report in Agrimoney, an industry magazine. “Strong import demand [in China] is likely to persist at least through this year,” USDA said. The uptick isn’t just from U.S. producers, as the European Union and the U.K. have also reported higher hog prices this year on demand from China. Since Jan. 1, U.S. lean-hog future prices have increased by more than 40 percent, outperforming agriculture futures such as wheat and corn, commodities such as gold and oil, as well as the broader S&P 500 index. And that’s been a boon for U.S. producers. U.S. demand for pork has been flat, so producers are looking to secure new production and slaughtering capacity to meet international demand. A chief challenge for American farmers is production process. 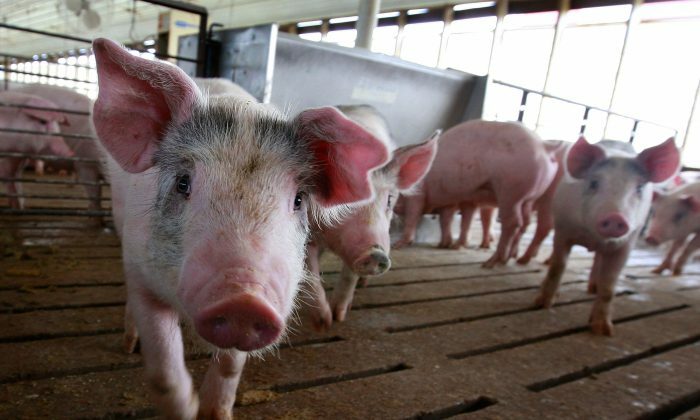 China and a host of other Asian pork-importing nations ban a growth-stimulant called ractopamine, which the majority of U.S. producers use as a feed additive. Smithfield Foods Inc., the American pork company now owned by China-based Shuanghui Group, has long been one of few U.S. producers having access to the Chinese market due to its dedicated growth stimulant-free plants and facilities for export. The runaway price of pork also presents a dilemma to Chinese policymakers. But U.S. producers are ramping up capacity to pivot abroad. AGWeb, an agricultural industry journal, says that new pork processing plants are expected to come online in Michigan, Minnesota, Iowa, and Missouri by later this year or early 2017 in part to meet rising Chinese demand. On the one hand, Beijing wants to keep pork and other food staples affordable to dispel the specter of social unrest. On the other hand, pork price is a prominent component of the consumer price index (CPI), as the country looks to target 3 percent inflation for 2016. China CPI rose 2 percent in May from 2015, according to official data from the National Bureau of Statistics (NBS). That’s within the target range—a bit below 3 percent but above levels that would trigger deflation concerns. It also gives China enough room to keep monetary policy loose. But that figure includes impact of sky-high pork prices. The average pork belly meat prices in 50 Chinese cities have increased from 23.80 yuan to 33.20 yuan per kilogram from January to June, a 40 percent increase, according to NBS. For now, pork is high enough to stave off deflationary fears elsewhere in the Chinese economy—the plunging producers pricing index, for example—but it’s a matter of time deflation fears kick in once more.